You can use the Eyedropper tool to copy colors or gradients from one control to another. 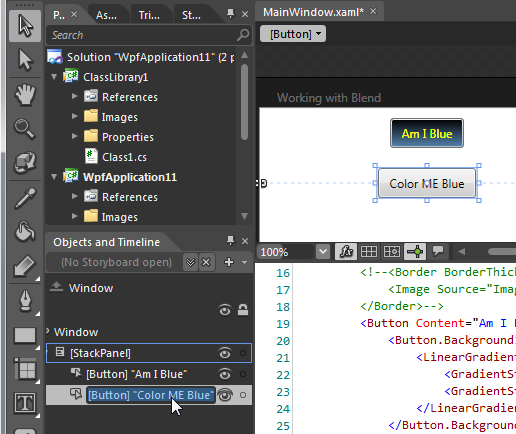 Start by selecting the control that you want to copy colors to. In the example below, we want to copy both the background gradient and the foreground color from the top button to the bottom button. So we start by selecting the bottom button. Next, select the Eyedropper tool. The cursor will change so that it looks like an eyedropper. Move the cursor over the control that you want to copy colors from. 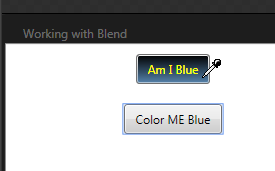 Then left click on the control that you are copying colors from. 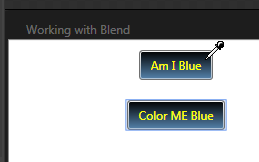 Both the foreground and background colors are copied to the control that you originally selected. Note that when you use the eyedropper tool to copy colors, all properties that have color values in the source control are copied to the target control.